Finally we’re getting a break from the rain! I am thankful for the rain, we needed it, but also thankful to get a few days of sunshine and the pups are thankful for more walks outside. 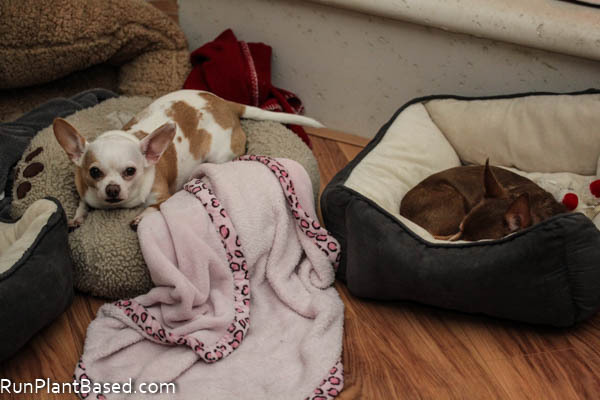 Well, Leela wasn’t so thankful when Miko stole her favorite ratty bed by the fireplace. And Miko pouted because she wouldn’t let him get his toy he left in the other bed. Such drama. 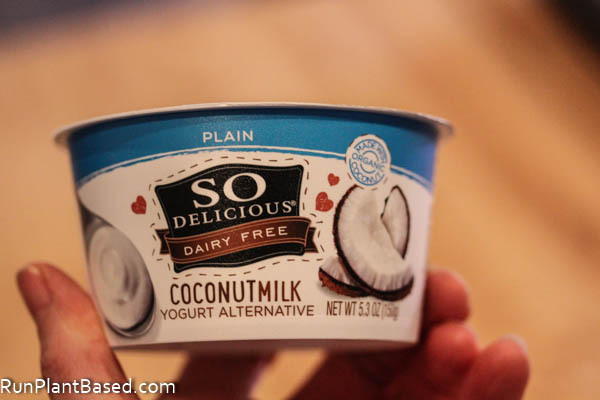 Last weekend I impulse bought So Delicious Coconut Milk Yogurt Alternative from Grocery Outlet to try because the price was awesome. Then I remembered I’m not a huge yogurt person typically sticking to smoothies for breakfast. But these are a delicious addition to smoothies and they also make a great salad dressing. This plain flavor is slightly sweetened and has a thick and creamy texture, so I decided to try it in a balsamic “yogurt” dressing. This dressing has a blissfully simple list of ingredients and there was no need to add a sweetener with the slight sweetness in the yogurt. 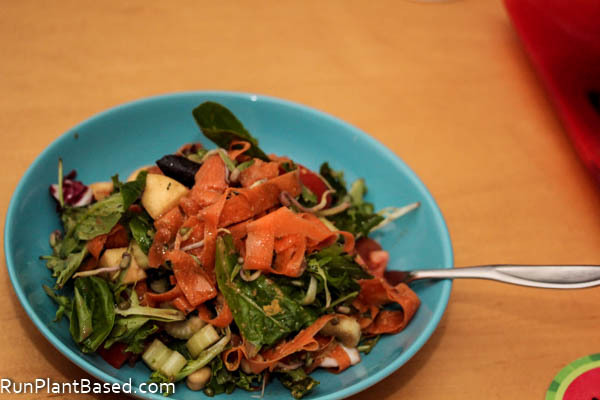 The color of the dressing was interesting, but it packs a creamy and tangy balsamic flare that worked well with this chickpea, sprouts, and chopped apple salad. 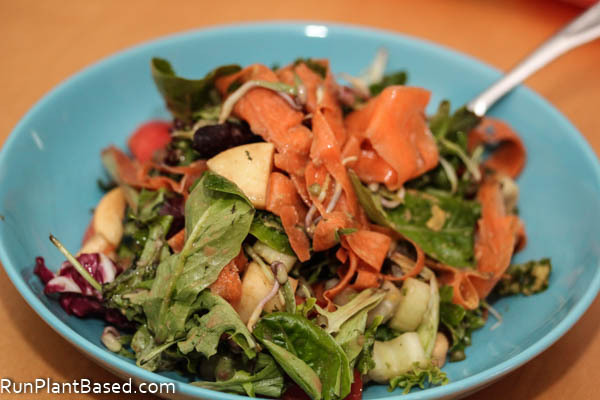 The dressing has a strong balsamic flavor that adds a lot of flavor, but isn’t too heavy. 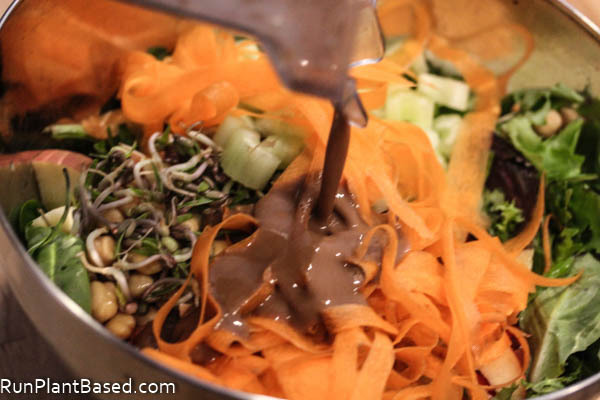 Vegan yogurt can be awesome for sauces and dressings too. I’m so with you! I’m never been the biggest Yogurt fan and I usually keep it to my berry smoothies. But oh, you post the best dressing recipes ever! Yes, it can be a great addition to other recipes, but awkward for me by itself for some reason. Thanks on the recipe! Nice! I found a recipe to make vegan yogurt in our pressure cooker that I might need to try! What a score! I love those plain/unsweetened coconut yogurts, but they can get pricey around here. I don’t often eat yogurt straight, but it’s fabulous for baking and cooking. Yes, I’ve seem them at other stores and decided to snap them up at GO. I occasionally find Almond Dream yogurt too, very good in smoothies.